Carbon dioxide (CO2) emissions from US energy consumption will remain near current levels through 2050, according to projections in the US Energy Administration’s (EIA) Annual Energy Outlook 2019. 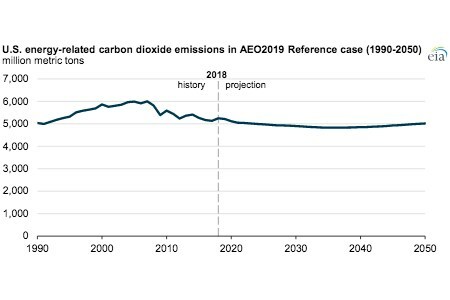 The AEO2019 Reference case, which reflects no changes to current laws and regulations and extends current trends in technology, projects that US energy-related CO2 emissions will be 5.02 billion t in 2050, or 4% below their 2018 value, as emissions associated with coal and petroleum consumption fall and emissions from natural gas consumption rise. Natural gas is the least carbon-intensive fossil fuel, and has for decades made up the smallest portion of US energy-related CO2 emissions. However, in 2015, natural gas emissions surpassed coal emissions, and the AEO2019 Reference case projects that natural gas CO2 emissions will continue increasing as natural gas use increases. By the mid-2020s, EIA projects that the industrial sector will again become the largest consumer of natural gas, using natural gas as a feedstock in chemical industries, as lease and plant fuel, for industrial heat and power applications, and for LNG production. The residential and commercial sectors are also expected to continue using more natural gas. For instance, EIA projects that natural gas furnaces and boilers will be used in 55% of US homes in 2050, an increase from their 49% share in 2018. Hydrocarbon Engineering is not responsible for the content of external internet sites.